Painting floorboards is not new, but you have to admit, they can look especially amazing if you use stencil patterns and a great paint color combination! Stencils offers a simple way to decorate your floors but unless you are very dedicated, try restricting your DIY efforts to smaller rooms. Painting floorboards is not difficult. But adding stencil patterns to painted floorboards is not always easy. I've mostly focused on floorboards but you can use the basic principles on concrete floors, most wood floors and of course, walls. LovelyEtc.com show exactly this can be done from ripping up carpets, painting your floorboards, using floor stencils and finishing off. It took months to get it all done but the transformation is huge. 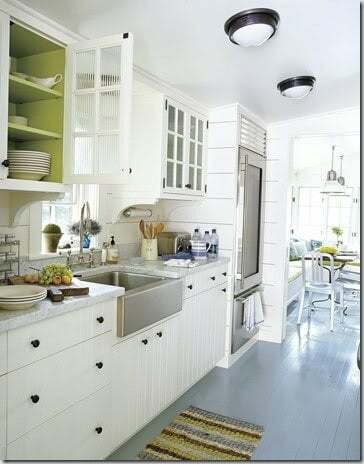 Here is part of the article Amazing Painted Floors: A How To below. You can read the full article here at LovelyEtc.com. I think I'm kind of in love with these floors. This was not a quick or easy project but it was sooo worth the effort. I should add here that this project does not have to take months to complete - I had lots of delays with the holidays and general busyness. Here is a quick run-down of how I did it. Rip out old carpet and carpet padding. Remove all tack strips and staples from subfloor. Patch the seams and staple holes. (This is the only part I really wasn't pleased with. I used Flexible Floor Patch and Leveler. This was not the right choice. It is good because it flexes with the floor and all that stuff. But it is horrible because you can't sand it smooth). Sand the floor. We just used a small palm sander but of course a large floor sander would work much faster. Just remember that this is plywood - it is not going to be silky smooth. Paint border around room (Valspar ‘Crucible’). To get nice crisp lines follow these steps. 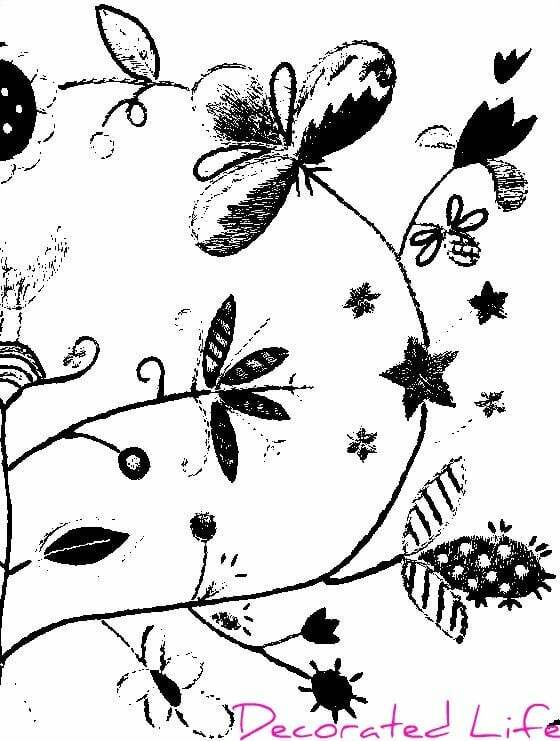 Stencil the design inside the border. (Paisley Allover Stencil from Cutting Edge. Floor stencils look great. 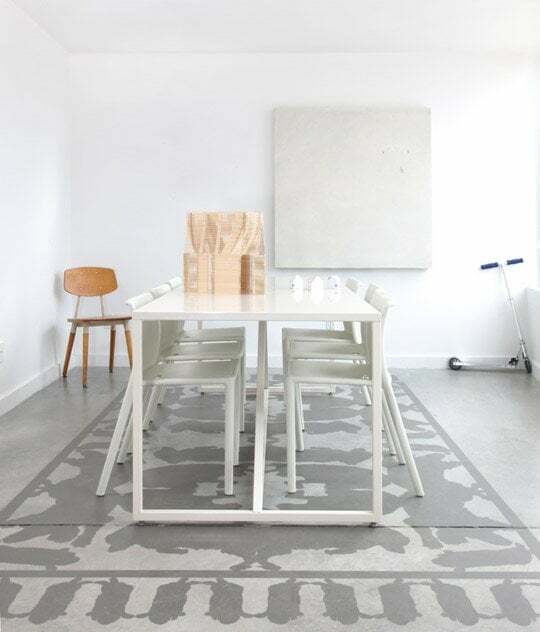 Marking out your floorboards or concrete floors that can be difficult, so it's good to either buy or create floor stencils with markers to make the job easier. 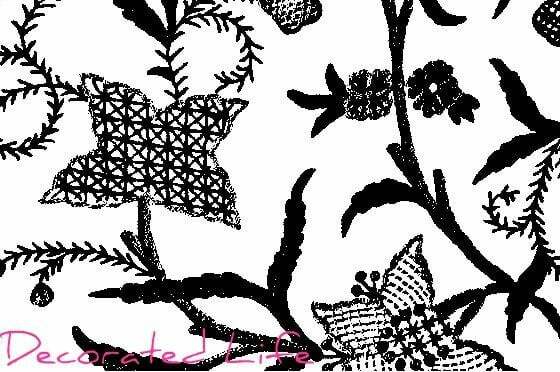 And there are so many great stencil patterns available that you will not run out of choices. Of course, you don't have to use stencil patterns over an entire area. Adding a border or a flowered stencil pattern to some of your painted floors can be enough to create a great look as long as the paint color you use blends in to your decor. 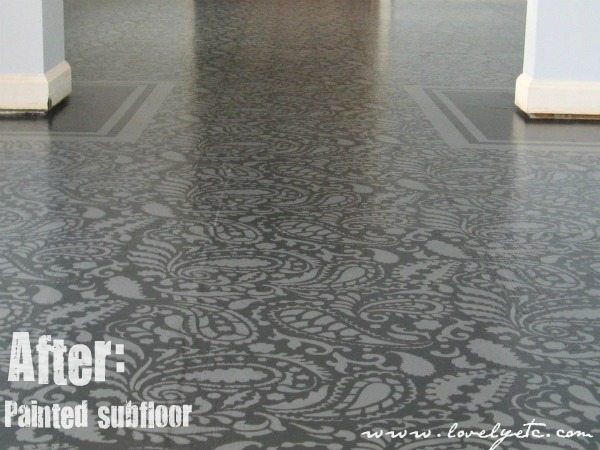 You can choose a more outrageous floor stencil pattern if you have muted or white walls. Choosing your paint color, stencil patterns and painting floorboards is only part of the process. You can buy pre-made stencils, using either wall stencils or floor stencils to use on your painted floors. Or you can make them. I found a great site Strix.org.uk. Look at the stencils I made in just a few seconds using photos of fabric. I've reduced the size of the stencils. If you would like a copy of these let me know. I'm not sure what paint color I would use but the simpler the color scheme the better. In fact, just one stencil paint color is enough to make you floorboards or concrete floors stand out. This is a great paint tool if you want to match up patterns with say curtains - or just want to cut down on your floor stencil costs. 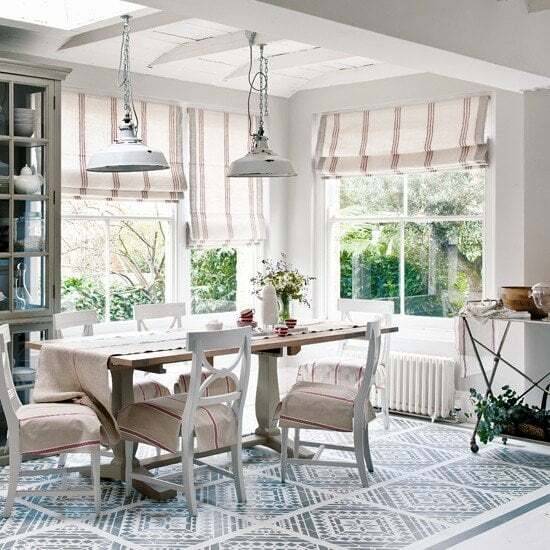 Stenciling painted floors is inexpensive if you DIY but it's still not 'cheep'. You can create wall or floor stencils for floorboards or concrete floors. Use a craft knife with a lot of spare blades to cut out your design.. it's important to have a good finish. Cut out the design with a smooth, flowing motion, moving your card, plastic or newspaper when a cut changes direction, not the blade. You can use fix the stencil using spraymount available from graphics suppliers. It has enough glue to keep it in place multiple times without lifting paint from your painted floorboards. Use any kind of long wearing paint that dries fast. Emulsions take longer with more room to smudge. Use a soft busy rounded bristle brush with a circular motion. Use the least amount of paint on your brush to create a clear, soft image and avoid smudging. One color is faster and easier than choosing multiple color designs for painting floorboards. Varnish your painted floors to protect them after about two weeks to 'distress' them a little. Two coats of varnish is probably enough. The type of varnish you use can darken or even lighten your paint color. So remember to ask your supplier. After a year or two - or when wear and tear are showing - wash the surface with a sugar soap solution, rinse well, leave to dry and re-varnish. Painting floorboards and then applying stencil patterns is a great way to decorate floors. I know white-painted floorboards have been the rage for a while but adding another paint color can really make a bold statement. Remember you can also use this method on concrete floors like the rug above. Please leave a comment below - Like us on Facebook and please, share.. it's all about sharing. Don't forget to Join our Newsletter here! There are more article like this one. Just look below.